The Central Board of Secondary Education (CBSE) has issued a notification on its website to inform all the students and stakeholders that the board will not conduct any re-examination of the BSE Class 12 Physics and Economics papers. Actually, for last few days a message in the name of CBSE, is being circulated through a messaging app which states that the board will re-conduct the examination of the Class 12 Physics and Economics papers. This fake message is dated March 28 and is signed by the KK Choudhury, the former controller of examination. Encountering the whole scene, CBSE issued a public advisory on its official website to declare that the notice doing the rounds is entirely fake and baseless. 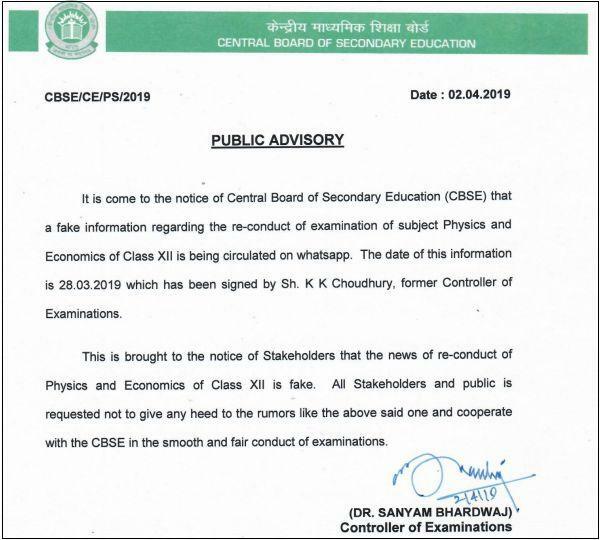 CBSE’s public advisory on fake messages reads, "It has come to the notice of Central Board of Secondary Education (CBSE) that fake information regarding the re-conduct of examination of subject Physics and Economics of Class XII is being circulated on whatsapp. The date of this information is 28.03.2019 which has been signed by KK Choudhury, former Controller of Examinations. This is brought to the notice of Stakeholders that the news of re-conduct of Physics and Economics of Class XII is fake." The board in its notice, has also requested all stakeholders and public not to give any heed to the rumours like this and cooperate with the Board in the smooth and fair conduct of examinations. The CBSE examinations 2019 for both classes 10, 12 has been concluded and the evaluation process for the same has been initiated already. This year, the CBSE results for class 10 and class 12 are expected to be out within the first or second week of May. However, the board has not released any confirmation date yet.